I finally made an easel card! I've been threatening to do this for months and eventually got round to it on Saturday morning when I made Ali's Valentines card! Completely love the effect and can't believe how easy it is.... expect to see more of these on a blog near you very shortly! I pulled out my favorite papers from Pink Petticoat and am so pleased with how it turned out. I think it is nice and lovey-dovey whilst still being a little bit masculine. Well, Ali liked it anyway! Cute Card Thursday - In the Name of Love. Creative Card Crew - Valentines. Secret Crafters Saturday Challenge - Multifold. Simon Says Stamp - Love. Thanks for stopping by today. I think I am slowly getting myself organised and am gradually making my way around all your lovely blogs to leave some nice comments! I'll get there in the end, I promise! Stacey what a beautiful Valentine and fabulous easel card!!!! What a fab, easel card. Love the funky papers. Thanks for joining us this week on the Secret Crafter and good luck in the draw. Fab card - love the papers! Oh I love the sentiments, fabulous card. Stacey, this paper is gorgeous! Love it. Hi Stacey, this is a great Valentine's card, that paper is lovely! 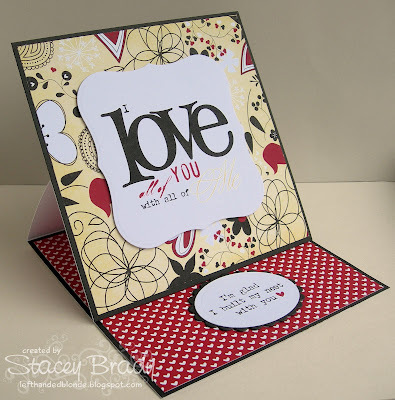 Beautiful card and love the color combo you used too! 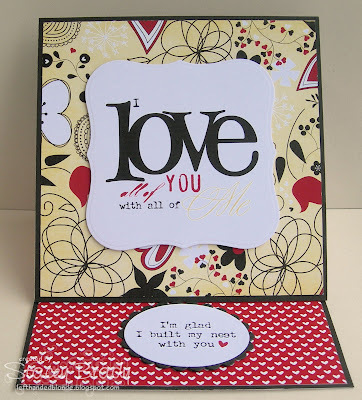 Fabulous easel card, it's surprising how easy they are once you take the plunge to do one. It took me ages to get round to trying them and loved it. simply beautiful! LOVE the papers and the colors!